Pustakam.net had requested for help to add Telugu books to the Project Gutenberg. As part of that initiative, volunteers of Pustakam.net digitized Shubhalekha, a Telugu story by Mahidhara Ramamohan Rao and made it available on the Project Gutenberg website. Shubhalekha is now (actually it has been a month) available to read freely online. You can even download it in various formats for different ebook reader devices. So, here is the link: Shubhalekha on Project Gutenberg. 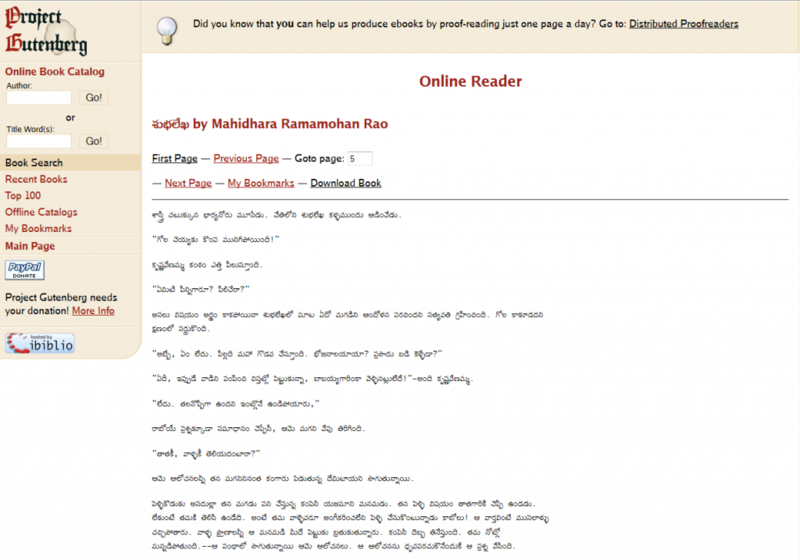 This is only the first Telugu ebook on Project Gutenberg. And, you can help Project Gutenberg to have more Telugu ebooks. You can help in typing, proofreading, etc. If you are interested, join the Guternberg_te Google Group. I hope we will see more Telugu ebooks soon.